Low-cost key ring mount for all F5 MicroCan iButtons. 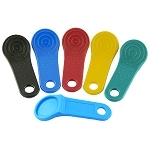 The DS9093Ax key ring mount is available in five colors: black, blue, green, red, and yellow; all other Maxim fobs are only available in black. 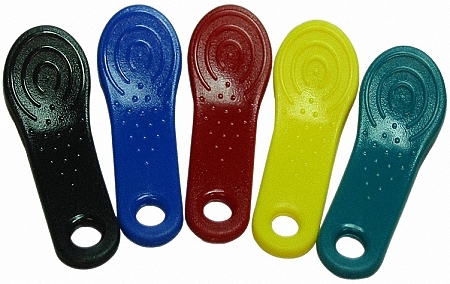 The DS9093Ax fobs are designed to hold F5 MicroCan iButtons only (as are all Maxim iButton key ring mounts). An iButton is inserted permanently into the fob by press-fitting the iButton's flange into the cavity of the fob. iButton is a registered trademark of Maxim.